In a completely genius move of counter-programming, Jermyn Street have chosen to stage a most unusual Christmas show: a celebration of two 19th century Scottish grave robbers, completely with jolly songs, bad jokes, and on stage corpsing of the most literal sort. With three actors playing more roles than I could count (yet all nicely delineated by clothing and accent), the night moved at a whirlwind pace, barely seeming to leave the central room at the lodging house where Mr Hare (Alex Parry) lives along with his wife, the proprietor (Katy Daghorn). Burke (Hayden Wood) shows up, short of cash, but willing to work; and when a chance comes to sort a dead lodger’s debt by selling off his corpse, Burke shows little shyness in joining in the Hares’ plans. The particular genius of this show is how so few actors in such a tiny space manage to do so much, conveying the back alleys of Edinburgh, the blood-splashed lecture halls of the cadaver-hungry doctors, and the heave and squalor of a rooming house not of the highest class. Much credit for this no doubt must go to director Abigail Pickard Price and designer Toots Butcher; Jermyn Street is very much an intimate theater but they created a space that felt far larger. And the comedy was right on target – black at times but full of silliness especially as the various actors attempted to compensate for the shortage of bodies to fill the roles (see what I did there?). 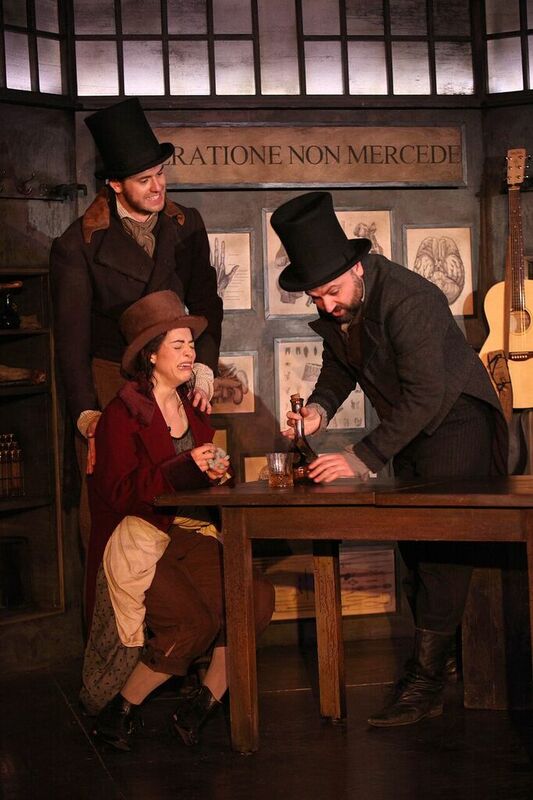 Burke and Hare, full cast – Hayden Wood, Alex Parry, and Katy Daghorn. Photo by Philip Tull. My worry was that this story would completely descent to goriness, given that I’m fairly phobic about blood, but most of the spare body parts were so silly that I couldn’t have been the least bit frightened; and there was, in the end, only one murder scene, played toward then end and actually quite moving. If you add in the fact that the corpse on stage the longest appeared to be giggling under her sheet, the overall effect was leavened with enough humor – gallows humor, shall we say – that I was able to make it through the entire play without getting creeped out. While Burke and Hare is not going to be stealing punters away from the Palladium panto, pretty much every theater goer in town is going to want a break from endless helpings of treacle and mince pies, and this show is just right for us – zippy, fun, tightly performed, and with enough of a feeling of improv that every night should feel fresh – just like the corpses.